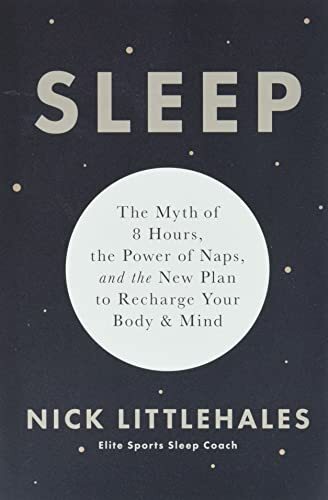 Nick Littlehales argues that we sleep in 90 minute cycles, and that we need to go through 4 or 5 of these sleep cycles each day. But we do not need to get them in one continuous period of sleep: we can have a shorter sleep and then get another cycle later in the day with a 90 minute nap, preferably in the early afternoon. These are the distinctive features of his message, and he also endorses many of the other bullet points that are familiar from other sleep experts: sleep is important for mental and physical health, and should not be skimped, we sleep better with a regular bedtime, free of electronic devices, in a cool dark room. We should prepare for sleep by avoiding most vigorous or stimulating activities before we sleep, and we should avoid the blue light associated with many electronic devices. There's a surprising chapter on what mattress to use to sleep as well as possible. Littlehales recommends that couples should use a king-size mattress. He also goes into the best pillows and bedding to use on the bed. Furthermore, he recommends sleeping in the fetal position. It's possible to find plenty of articles and interviews online with Littlehales that explain his ideas succinctly (for example, a podcast at Becomingasuperhuman). But the book has more detail in it, and certainly will be of interest to people who like napping or find it difficult to sleep all the way though the night. There is the question of how much scientific evidence Littlehales can provide for his claims about focusing on the 90 minute sleep cycle. There are several pages of footnotes to scientific articles. But while there does seem to be plenty of evidence for the importance of sleep, opinion seems to be more divided on whether napping is a good idea, as opposed to sleeping through the night. There's also the question of how much variation there is between different people -- most sleep experts write as if their recommendations apply universally, and Littlehales does this to some extent. It's probably good to take the views of the experts seriously, but also to remember how often experts turn out to be wrong, so people concerned about sleep should do their own experimentation and see what works for them.